The Timberwolves generally remain stuck in an antiquated mindset and offense that leads to a lot of long two-point shots and not enough three-point shots. The Timberwolves cracked 100 points Wednesday night for the first time in the 2016 calendar year. They still lost 107-104 to Houston — their seventh consecutive loss in this calendar year, and part of a 4-20 stretch that followed a respectable 8-8 start — but in general it was one of their better offensive games on may levels. They got to the free throw line 30 times (making 24, for a solid 80 percent mark). They rebounded well (holding a 43-39 edge over the Rockets, including 14-8 on the offensive glass). They didn’t take a ton of threes (17), but they made a bunch (8). The tale of the game was an inability to get defensive stops and the carelessness that led to 21 turnovers (8 by Ricky Rubio). The tale of the season, however, remains pretty simple: while the Wolves do some things decently offensively, such as getting to the line and making free throws — which boosts their True Shooting Percentage, a stat that takes into account twos, threes and free throws, into respectable territory (.530, just a tick lower than the league average of .535) — they generally remain stuck in an antiquated mindset and offense that leads to a lot of long two-point shots and not enough three-point shots. *Just 18.9 percent of the Wolves’ field goal attempts this season have from three-point range, the lowest mark in the NBA. And it sags well below the NBA average of 28.2 percent of all shots being three-point attempts. *That wouldn’t be quite so bad if they were a team driven by high-percentage shots at the rim (either by penetrating guards or big men), but that’s not the case. They’re taking 28.1 percent of their shots from 0-3 feet, which is below the league average and ranks 20th in the NBA. *That leaves a lot of shots in the middle. Way too many. Specifically, for the Wolves, it leaves a TON of shots in that dreaded “Long Two” range between 16 feet and the three-point line. For the season, a full 26 percent of Minnesota’s shots have come from that distance. That’s the most in the NBA, and it dwarfs the league average of 16.5 percent. *So it’s pretty clear when you look at those numbers: the Wolves take about the same number MORE long twos as they take FEWER threes compared to the average NBA team. What does that mean to the bottom line? The Wolves’ shooting percentage on long twos (shots between 16 feet and the three point line) is 39.6 percent — 334 makes on 843 attempts. So their effective field goal percentage on those shots — which adjusts for the fact that a three-pointer is worth 1.5 times as many points as a two-pointer — remains static at 39.6. The Wolves are not a great three-point shooting team (they’re 203 for 614 on threes this season for 33.1 percent, 25th in the league). But their effective field goal percentage on those attempts is 49.7 percent when you multiply 33.1 by 1.5. So they’re taking more long twos than threes, even though those shots are less efficient. What if their shooting percentages on long twos and threes remained the the same, but instead of being well above and below the league average on attempts, respectively, the Wolves moved closer to league average in both cases by decreasing by 10 the percentage of overall shots that were long twos (down to 16 percent total) and increasing by 10 percent the number of overall shots that were threes (up to 28.9 percent)? Well, the Wolves have taken 3,257 field goal attempts this year. If the percentages of attempts went down (twos) and up (threes), they would have attempted 521 long twos (instead of 843) and 941 threes (instead of 614). They would have made 206 long twos (instead of 334, a decrease of 128 makes and 256 points). They would have made 311 three-pointers (instead of 203, an increase of 108 makes and 324 points). So add 324 points and subtract 256 from their season totals, a net gain of 68 points — 1.7 points per game. And that’s for a team that doesn’t even shoot three-pointers very well. *Now also consider this crazy statistic: Of the three-pointers attempted by the Wolves, only 18.7 percent have been “corner threes, the second-lowest percentage in the league. Those baseline shots are from a shorter distance than from other spots behind the arc and therefore are made at a higher rate (NBA average on all three-pointers: 35 percent made; average on corner threes made this year: 37.6 percent). But here’s the really crazy thing: the Wolves are REALLY good at shooting corner threes. They’re making 41.7 percent of their threes from the corners, well above the NBA average and third-best in the entire league. The optimist would say the high percentage means they are being selective. The pessimist would say they are not playing to a strength. Now, some of the final analysis in all this is a little more complicated than just laying out numbers. It could be argued that the Wolves don’t shoot a lot of threes because they don’t have a lot of players good at making threes. And maybe some of those players are more comfortable moving a few feet in, even if the numbers suggest that’s a far less efficient shot overall. What’s not complicated is this: the most efficient shots in the NBA right now are at the rim or behind the arc. Any offense that produces a preponderance of shots in the other areas of the court is not efficient. Only 48 percent of the Wolves’ shots this year have either been at the rim (between 0-3 feet) or from behind the arc. 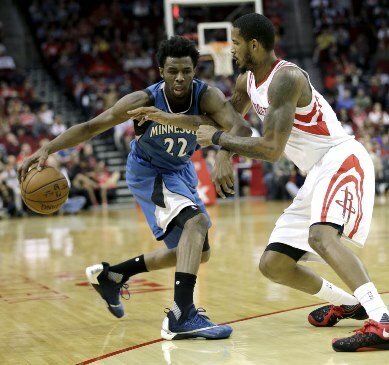 Houston, which beat the Wolves last night, leads the league with 69.5 percent of its shots coming from those spots. And Wolves opponents combined in 40 games are taking 60.7 percent of their shots between 0-3 feet or beyond the arc. In short, the Wolves have plenty of deficiencies. But at the top of the list still is inefficiency.